Halogen Free for applications requiring Zero Halogen raceway and innerduct. ENDOCOR/RI is UL Listed fin the USA and Canada or Riser installations and conforms to NEC Article 770.53. ENDOCOR/RI is designed for installation in risers shafts in buildings. ENDOCOR/RI is a corrugated, non-metallic raceway that is very flexible for ease of installation, yet strong enough to protect delicate fiber optic cables. 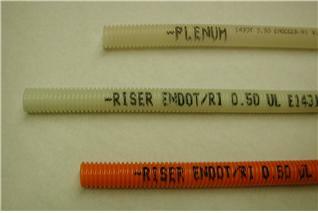 Use of ENDOCOR raceways for premise wiring provides a clean low friction installation path for fiber optic cables and allows for future replacement of cable if upgrades are necessary. 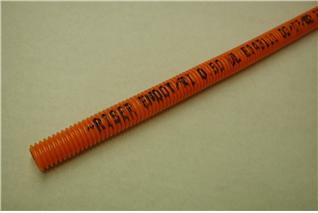 ENDOCOR/RI is available in sizes from ½” ID through 2” ID and all sizes can be supplied with UL Listed pull line. ENDOCOR/RI raceway is available in orange or white. Custom Colors Available. ENDOCOR/RI raceways are clearly printed with sequential footage marks. Custom printing is available. ENDOCOR/RI can be packaged in coils, boxed coils or put up on reels from 48” to 96” diameter. Give us your packaging requirements and we will provide what you need. 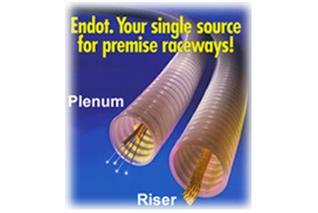 ENDOCOR/RI can be provided with Riser cable pre-installed in the raceway. Call us for details. ENDOCOR RI is produced from nylon resin and is non-halogenated. 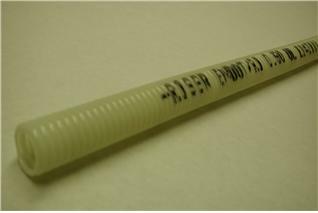 Nylon also is flexible at all temperatures and will not become brittle at low temperatures as other Riser products will. The use of Riser Raceway does not eliminate the need for riser rated cable. Maximum Flame Propagation UL 2024, sec.9 4.25 ft. Maximum Damage Height UL 2024, sec.9 6.75 ft.